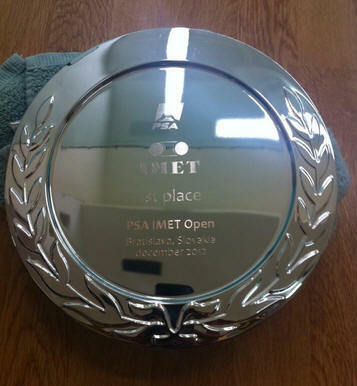 Scotland's Greg Lobban rounded off his maiden year as a member of the PSA in perfect style by winning his first PSA World Tour title at the Imet Open in the Slovakia capital Bratislava. Competing in only his ninth PSA event, the Inverness-born 20-year-old was the eighth seed in the $5k challenger event at the Imet Squash Centrum. Lobban, ranked outside the top 100, made his breakthrough in the quarter-finals - defeating Austria's No2 seed Aqeel Rehman before going on to oust fifth-seeded Frenchman Lucas Serme in the semis. But his final opponent was also on a roll: Englishman Joel Hinds, the third seed, claimed his unexpected place in the climax after upsetting Denmark's top seed Rasmus Nielsen in a five-game semi-final. Lobban had the winning post in his sights, however, and defeated Hinds 11-7, 9-11, 11-8, 11-6 to become the first Scottish winner of a PSA title for more than two years. Greg Lobban: "Just beat Joel Hinds in 4 games to claim my first ever PSA title. Over the moon right now."